This week Jeremy and I went up to New York for a digital music conference, as well as meetings with accounts and the guys we work with at Warner, our parent company. I’ve been to New York before, but only once, and only for a brief period of time. I never really had the chance to experience the city before, but this week I did! One of the things that stuck out to me about New York is that they have PERFECTED the art of not wasting space. They are space “efficientists”. Vacancy is a scare resource, and they use every square inch of it. Buildings are squeezed together impressively tight. If a road curves or angles, the building architecture curves and angles with it to make the most of all the real estate. Sidewalks are a good 15 inches narrower in New York than any other city to grant more internal square footage. They say the only place to build is up, and New Yorkers do this well. Of course they have the skyscrapers, but anything and everything can be put on top of another building. Watertowers, and playgrounds, and basketball courts are launched upwards, and the buildings themselves are additions to the decades-old foundations, creating a continuous inseparable concrete / metal mass running the length Long Island. There are 305 million people living in the United States. 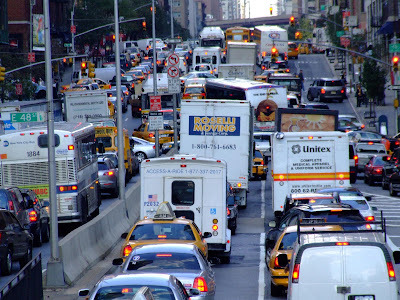 150 million of those people live in New York City, and 100 million of them are cab drivers. As we were heading out of town in our taxi we drove by a house in Queens that had a short little wrought iron fence outlining a tiny yard the size of a Fiat. In it were piled a trampoline, a bicycle, a push lawn-mower, a swing set, a toy tractor, and a jungle-gym. There was a little seven year old boy playing in the backyard… actually he was just looking out the living room window smiling, imagining what it would be like if he had room to play in the backyard. Sometimes there is an architectural oversight and a property owner is left with the smallest piece of vacant land after his building is erected. In this case the city immediately claims eminent domain, paves it, and lays down a set of solid yellow lines to convert it into a parking space. Actually, this rarely happens as there are only 7 parking spaces in New York City. 2 are in lower Manhattan, 3 on the Upper West Side, 1 in Greenwich Village, and 1 is a park-and-ride up in the Bronx. If by some act of the Almighty you are blessed with finding one of these spots, it will take an equally supernatural force to lift and place your car into a space the size of a twin-bed. It’s impossible to park under your own power, though some have tried, resulting in over 700 million deserted cars strung up and down the streets of the city. Their owners just got up and walked away. The cost of the car was less than the cost of time spent trying to maneuver into a spot. That’s actually how Hertz Car Rental got it’s start. A couple guys from Jersey moved in, threw up some big yellow signs on street corners and started renting out deserted cars to travelers for 70 bucks a pop. And that’s why everyone started taking taxis in the first place… they couldn’t find a spot to park their rental, so they just gave up and hailed a ride into the city. As a rule I try to avoid these Christian pop-culture type books (yet somehow I always end up reading them anyways). This book has caused such stir and I decided I needed to give it a look so I could make some decisions for myself. There are two types of reviews for The Shack: I would say that most people who read it claim it is the most insightful, life-changing, incredible most wonderful book ever that grants them a completely new picture of who God is. Then there are those who denounce the book as complete heresy. I’ll say this – it’s a well written and intriguing story that forces you to ask questions about the relationship between God and mankind, and the relationship of God within the Trinity. It poses thought provoking illustrations of God, but it would be a stretch to say it outlines scriptural truths. The primary gripe people have with The Shack is that God the Father is portrayed as a heavy-set, gregarious, black woman. At first my thought was, well, who I am to say what God does or does not look like? He’s God and He could just as easily present himself as a white-haired, elderly gentleman or as a gregarious, black woman, right? Well, the issue isn’t whether He could or could not. The issue is that we are ascribing images to God the Father that we do not have the right to ascribe. I didn’t fully understand the ramifications of this prior to reading J.I. Packer’s book Knowing God where he demonstrates the danger, and commandment against, creating images of God whether they be physical, pictorial, or textual. The danger is that when we make representative images of a God who in all literal terms defies comprehension and is beyond our realm of reality and vision, we end up containing God, and limiting his omnipotence. The very act of ascribing a representation to God places us in danger of making the created image the focus of worship, and elevating the image above God Himself. This was a truly fascinating book about the largest, most powerful, and successful company in the history of the world. It was a very insightful look into the company from all different angles including suppliers, manufacturers, competitors, enthusiasts and dissenters, employees, ex-employees, shoppers, non-shoppers, and so on. The book doesn’t take sides, but rather offers a careful analysis at both WalMart’s positive and negative effects on local communities, regions, the country, and even the world at large. It’s neither a pro-WalMart book nor an anti-Walmart book… but it forces you to think twice about how you shop, and where you shop. And above all it portrays WalMart as the very thing it strives to be… a retailer that provides “Always Low Prices”, regardless of the cost to vendors, economies, and even the customers. From 1997 to 2004, the US added 670,000 new retail jobs. 480,000 of those — 70% — were at Wal-Mart. When WalMart institutes changes that result in lower cost-of-goods, they pass the savings to both the vendors AND the customers, but not themselves. WalMart won’t pay to speak with vendors: vendors are required to provide Wal-Mart with a tollfree number, or accept collect calls. Of the largest 10 suppliers to Wal-Mart in 1994, five subsequently went bankrupt or failed. WalMart isn’t just Proctor and Gamble’s largest customer — they’re as big as P&G’s next nine customers combined. Consistently, as companies increase the share of their business with WalMart, their operating margins decline accordingly. Does WalMart create or take away jobs? Both. A new Wal-Mart may hire 300 people, but on average, 250 people at nearby businesses will lose their jobs, and about four local businesses will close. A study of Iowan small towns showed that restaurants near WalMarts had 3% increases in business, because of increased traffic, but nearby towns without WalMarts lost 47% of their retail sales, as customers drove out of town to shop at WalMart. The book goes on, and on, describing in incredible detail how all of WalMart’s behavior – their good behavior, and even their seemingly evil behavior – can be explained by the fact that the company is simply pursuing it’s vision of “Always Low Prices”. And that one consuming idea has shaped with profound effect an entire nation of consumers and their economy. This one was a tough read for me, not that the content wasn’t interesting, but that it was just a dry read (well, listen). It’s about the enduring conflict that is the war in Iraq and the war of ideology, strategy, and policy within the Bush administration that has amplified the painful effects of the conflict. It’s not a book about why we went to war, but about the fact that we are at war and we need a new strategy to get out of it. President Bush throughout this entire war truly believed in the mission he was pursuing, knowing his decisions weren’t popular, but in their difficulty were the right thing to do. This absolute confidence regarding the war were both President Bush’s strength, and his downfall. In spite of his resolute stance towards the war, the “mission” was never clearly defined, the goals were never discussed at length within the administration, and success was never outlined for the public. This lack of clarity around a reason and mission for the war is what has made it so difficult for me to support the last few years. Everyone has made personal judgments about the war over the past several years, and we’re entitled to those judgments because we live in America; but I know I want to be cautious about condemning too much because there is so much that we don’t know because there is so much classified information that won’t be made public fo years to come. And so whether it was “right” or “wrong” to go to war, I’m unwilling to say because I simply don’t know, and don’t ever expect to know. Regardless of whether it was right or wrong, Woodward gives credit to Bush for seeking out new strategy when it was apparent that the war was stalling out in 2006/07, and this “surge” strategy was at least partially responsible for the decreased levels of violence in Iraq throughout 2008. One last thought about all this: We think short term about the war because, obviously, we want it to be over and we want our troops to come home. And truly, I do hope the levels of violence in Iraq do quickly lessen, but we’re fooling ourselves if we think America is going to provide a quick fix and suddenly withdraw and everybody gets to come home. The situation in the Middle East is a long term problem and now that we’re there, we’ll likely be there for the next 50 years. The radical terrorism that breeds in the Middle East is not unlike the radical communism that bred in Eastern Europe 50 years ago, and if throughout this whole process in Iraq the United States can start to influence the region with democracy and begin to root out radical terrorism, then that is a positive outcome of this whole thing.